It was one of those days where you knew something was going to blow up in the atmosphere. At noon we had a dew point above 70° with southerly winds at 20 to 25 miles per hour gusting up to 30. I discussed the situation with Matt Ver Steeg. He was kind enough to call me and to inform me of the type of storms we could be dealing with in eastern Iowa. It was decided that bow echoes could form and that the best place to chase would be the northern most cell. Matt Salger and I headed north towards Decorah. When we got there, the storms were dumping heavy rain and also some hail. I decided that I didn't want to get close to them. Another storm started firing up to the south of us so I decided to get to the southwest side. We were able to find the updraft, there was a little motion but I decided that this storm would also produce heavy rain and hail but no twisters. I called back to KGAN and found out that there was a line trying to fill in back in the Ames, Des Moines area. I decided to wait it out and see what came of the line. Sure enough storms started to fire and the strongest ones moved right by my home town of Vinton. We had a rotating wall cloud to the north of town. Matt Salger and I followed it up to Urbana when it got rain wrapped. At this point we learned of another strong cell developing near Tama. They soon issued the following warning. Matt and I rushed back through Vinton so we could make it to the southern corner of the storm. We got a mile or two south of the storm when we decided to take gravel roads. The following warning was issued while we were heading toward the south western edge of the storm. We got to the southwest corner of the storm and watched it. When we arrived we got this nasty looking sky. 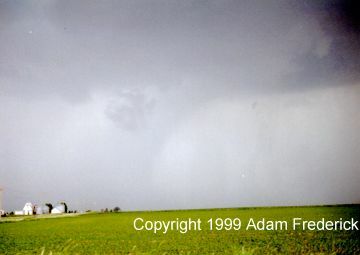 This photo was taken about 3 miles to the north northeast of Van Horne. We were looking north at the time the photo was taken. There was rapid movement in this storm. I called back to the station and Mike O'Lenick confirmed what I thought, that the storm was growing. We moved a little further west and a little north so we could get a better view. 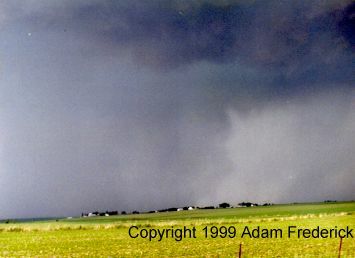 As we moved closer we saw the typical saucer section of a supercell thunderstorm. We moved in a little closer and discovered this little bit of rotation. As we followed the storm, the funnel started to drop. 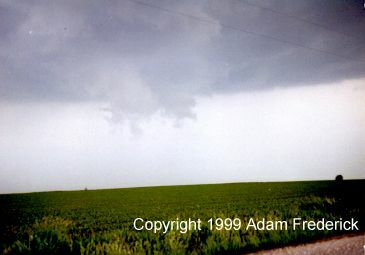 There was a large amount of rotation in the funnel and strong inflow. 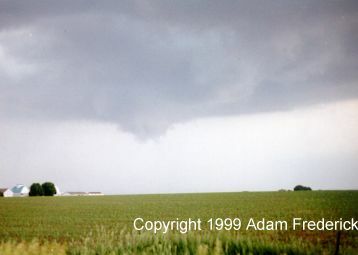 The funnel started to descend from the sky toward the ground. 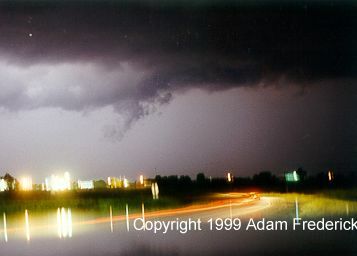 At this point there was so much close cloud to ground (CG) lightning that I stayed in the car. I knew that this was a dangerous storm that could easily put a funnel on the ground. 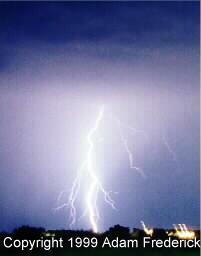 I called the NWS in the Quad Cities and informed them of what I saw. They said that they were glad that I called in since they didn't have anyone out there. Two minutes later they issued the following warning. 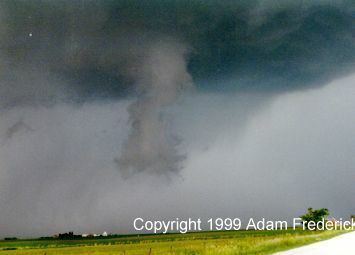 We followed this funnel into Linn County as this warning was issued. I reported on the storm live on KGAN via cellphone as I chased the funnel into Cedar Rapids. It was starting to get dark and I didn't want to chase through a city so I abandoned the chase. On the way back home, we started to drive North into another severe thunderstorm. 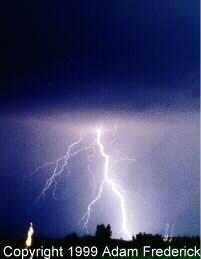 We stopped by Center Point and took the following lightning pictures. I also believe that I saw a funnel in the clouds but because it was dark I couldn't confirm it. The cloud was in the right place but it was hard to tell because it was dark.